Sound installation, Trondheim's Arts centre 1990, Norway. 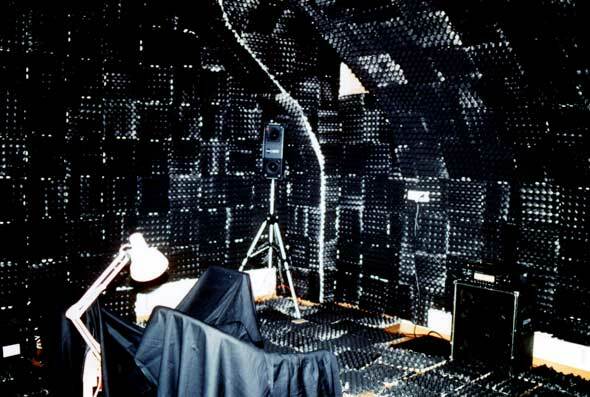 Walls, ceiling and floor were covered with black egg cartons to deaden the acoustic of the room and also make the room dark. The visitor was instructed to turn the side of the sign on the door to occupied, enter the room, lock the door behind him/her, go to the middle of the room and sit down, turn off the light and listen. The sounds were loops of different length. The sound that were used came from a man training bodybuilding, a laughing man, a frustrating singing man and a woman screaming opera song. The sounds were used both clean and in different way processed. The sound of the training man for example were played back reverse and on half-speed which made him sound like a beast in a cage walking to-and-fro.